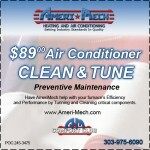 Air conditioner service cleaning and tune up coupon for $89! Increase air conditioner efficiency and performance by tuning and cleaning critical components. Mention this coupon at time of order. 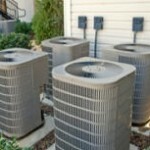 Includes Boulder air conditioner service and our entire service area including Denver, Boulder Co, Northern Colorado front range towns such as Broomfield, Westminster, Loveland, Lafayette, Johnstown, Greeley, Erie, and Windsor, up to Fort Collins, and many towns on the eastern plains. Call to confirm if this offer extends to your area. Click on coupon to get printable version. Offer valid only within our Colorado service area. Call 303-975-6090 for details. 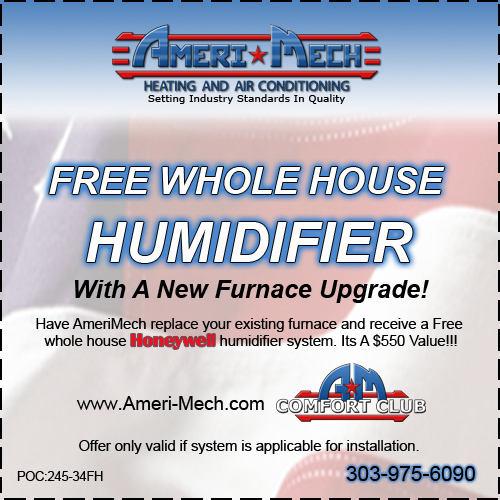 Coupon for free humidifier with a new furnace upgrade from Ameri-Mech Heating and Air Conditioning. A $500 value! Good only for the area we serve, which includes the front range including Boulder Co., metro Denver, Arvada, Brighton, Broomfield, Commerce City, Boulder, Erie, Lafayette, louisville, Westminster, Wheat Ridge, Northern Colorado towns Loveland, Johnstown, and Greeley, up to Fort Collins, and many towns on the eastern plains. Click coupon for printable version. 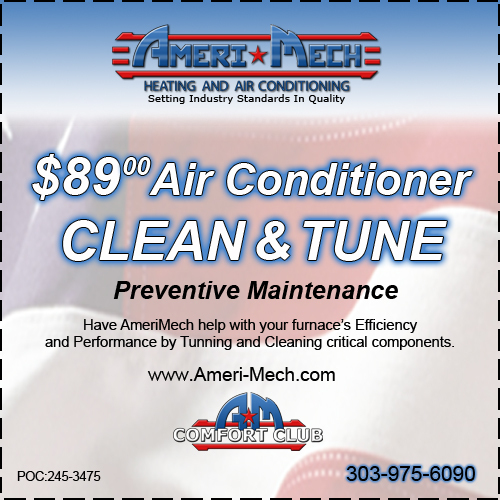 Call Ameri-Mech Heating and Air Conditioning at 303-975-6090 to confirm if this offer extends to your area. Hurry offer ends soon. 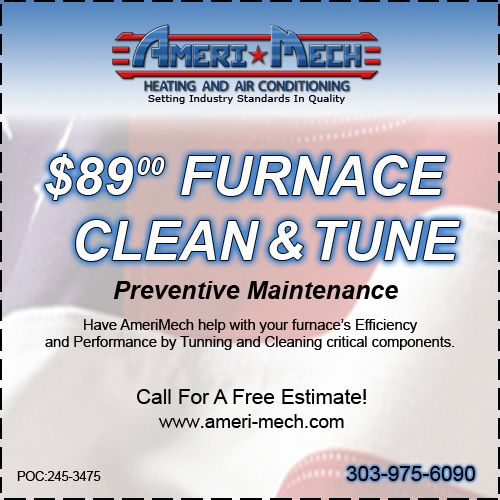 Furnace cleaning and tune up coupon gives you $89 off! 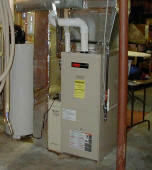 Increase furnace efficiency and performance by tuning and cleaning critical components. Mention this coupon at time of order. Good only for the area we serve, which includes Denver, Boulder Co, Northern Colorado front range towns such as Broomfield, Westminster, Loveland, Lafayette, Johnstown, Greeley, Erie, and Windsor, up to Fort Collins, and many towns on the eastern plains. Call to confirm if this offer extends to your area.